Last week, we had a busy week that included the main conclusion from the Tallinn Digital Summit, an update to the Schengen Information System and new legislation against unjustified geoblocking. We will also discuss EU funding opportunities for digital initiatives and lessons from the Europol-ENISA IoT Security Conference. 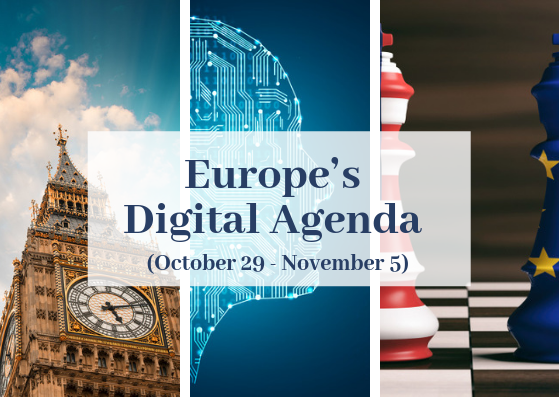 This week, we will talk about the US urging the EU to abandon its ‘digital tax’ proposal, tech experts gathering in London to discuss the future of AI and the EU and Singapore partnering on digital identity. The US Senate committee on Finance sent a letter to European Council president Donald Tusk and Commission President Jean-Claude Juncker to urge the EU to abandon the ‘digital tax’ proposal amid fears that American companies might be ‘unfairly targeted’ by the new regulation. The European Commission’s DST proposal includes the obligation for a tech company to pay a 3% levy on revenues where the profit is generated, rather than where the firm is domiciled for tax purposes. The US Senate said, “The EU DST proposal has been designed to discriminate against US companies and undermine the international tax treaty system creating a significant new transatlantic trade barrier that runs counter to the newly launched US and EU dialogue to reduce such barriers”. “We urge the EU to abandon this proposal, urge the member states to delay unilateral action and instead refocus efforts on reaching consensus with other leading economies within the OECD on any new digital taxation models”, it added. The German federal cabinet has published a list of key points it intends to follow to develop its Federal Government Strategy on AI. The German government is currently drafting its Strategy on AI, which is expected to be completed by the end of November and publicly presented at the 2018 Digital Summit in Nuremberg in December. The cabinet also said Germany’s research network will be further developed by establishing centres of excellence; it is also announced new research funding schemes to be introduced soon, with an agency for breakthrough innovations to be set up. 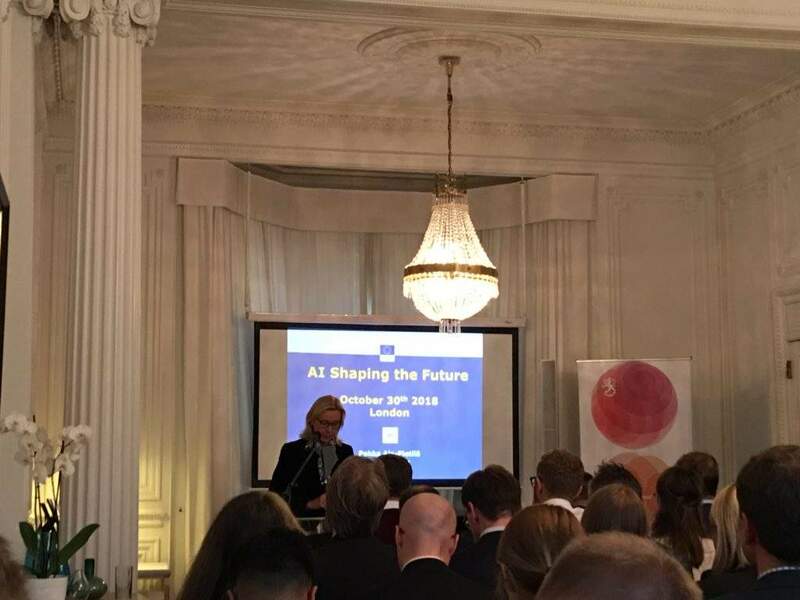 The Finnish Embassy in London has hosted the “AI Shaping the Future” seminar to discuss the economic and societal benefits expected from Artificial Intelligence (AI).The conference offered a platform for European tech experts to provide the audience with insights into the development of AI and identifying potential good practices and policy to enhance the development of AI across Europe. The conference saw speakers from the UK public sector, European institutions, tech industry and academia outlining their vision on the future of AI technology and the impact on society. Pekka Ala-Pietilä, chair of the EU’s high-level expert group on AI, outlined how competitive the EU is in AI compared the rest of the world. He said that the EU faces many challenges, including investment, where the US and Asia spend eight times more than the EU on AI. Ala-Pietilä also announced that the EU’s AI expert group will publish two papers by the end of the year: a draft on AI Ethics Guidelines, and policy and investment recommendations. The EU and Singapore will establish a joint task force to co-develop electronic ID frameworks that can work across borders, and trust services. Andrus Ansip, Vice-President of the European Commission in charge of the Digital Single Market, and Dr Janil Puthucheary, senior Minister of State for Singapore, announced the move in a joint statement during the Tallinn Digital Summit. “Online trust is essential for citizens and businesses. We believe that governments need to provide secure frameworks for digital IDs and electronic trust services – essentially “identity as a public service”. We believe this logic applies cross-border too”, they said. “We want this task force to develop, by early 2019, a Joint Roadmap towards an interoperability framework. The task force should also prepare joint pilots which are mutually beneficial, for instance in trade cooperation or academic exchanges,” they added. The EU’s eIDAS framework for digital identities allows European citizens to carry out secure cross-border electronic transactions in the EU. A new case study from the International Telecommunication Union (ITU) evaluates Moscow’s progress in meeting the objectives of its ‘smart city’ strategies and the United Nations’ Sustainable Development Goals (SDGs). The case study, Implementing ITU-T International Standards to Shape Smart Sustainable Cities: The Case of Moscow, was undertaken using the Key Performance Indicators (KPIs) for Smart Sustainable Cities developed by the United for Smart Sustainable Cities (U4SSC) initiative. “Moscow has made a rapid smart city journey from 2011 and we are keen on keeping up with the pace. No matter whether it is Moscow, Singapore or Barcelona – every city has the same task to make their residents’ lives enjoyable, safe and comfortable,” said Andrey Belozerov, the Strategy and Innovations advisor to the chief information officer of Moscow. The initiative will initially back 20 projects with a total of £117m (€132m) via the Horizon 2020 programme, and from 2021 onwards it is expected to fund a further 130 projects. Europe is determined to lead the development of quantum technologies worldwide. “We are working to secure a deal as soon as possible”, Theresa May’s spokesman said on Monday, adding that a decision on whether to hold a special Brexit summit later this month is up to the European Union. In the meantime, the UK Minister of State for Immigration Caroline Nokes said at a Commons’ home affairs select committee that it would be ‘almost impossible’ for UK employers to know which EU citizens can stay post Brexit. She said that the government will take a “pragmatic approach” to solve this issue, but admitted the situation would present an “enormous challenge” for both employers and EU citizens. Under the current cabinet’s plans, European citizens will be required to prove their eligibility to work in the UK via on online application process or through a smartphone app. The Home Office expects around 3.5 million applications for the new status. UK Parliament Public Account committee to takes evidence on Brexit and the UK border. PM Theresa May to attend an event at the Centre for Policy Studies on the launch of their new policy programme. Digital, Culture, Media and Sport (DCMS) Secretary Jeremy Wrightto speak at the Society of Editors. Congressional elections in the United States. UK Parliament Public Administration and Constitutional Affairs committee continues its inquiry examining the he Government’s Major Projects Portfolio – which includes 133 projects with a value of £423 billion. This includes HS2 and Hinkley Point but also major Government ICT projects, projects to transform public services, and major defence procurement programmes. UK Parliament Digital, Culture, Media and Sport (DCMS) committee will discuss: What next after the Cambridge Analytica scandal? What role can arms-lengths bodies have in regulating social media platforms, keeping our data safe and advertising models transparent? Looking further into the role digital technology will play in the future of government. UK Parliament Science and Technology committee will be looking further into the role digital technology will play in the future of government. elects the senior management team of the organisation, the Member States of the Council, and the members of the Radio Regulations Board. In 2018, the ITU Plenipotentiary Conference will meet for the 20th time in Dubai, United Arab Emirates, from Monday, 29 October to Friday, 16 November 2018. It will be preceded by the last meeting of the 2018 session of the Council on Saturday, 27 October 2018. The ISA² Mid-Term Conference: Linking Public Administrations, Businesses and Citizens is an event organised by the European Commission’s ISA² Programme on 29 November 2018 at the cultural house Flagey in Brussels. The conference will be opened by the EU Commissioner for Digital Economy and Society, Mariya Gabriel. The event will gather professionals from public administrations in EU countries and EU institutions, as well as from the private sector.